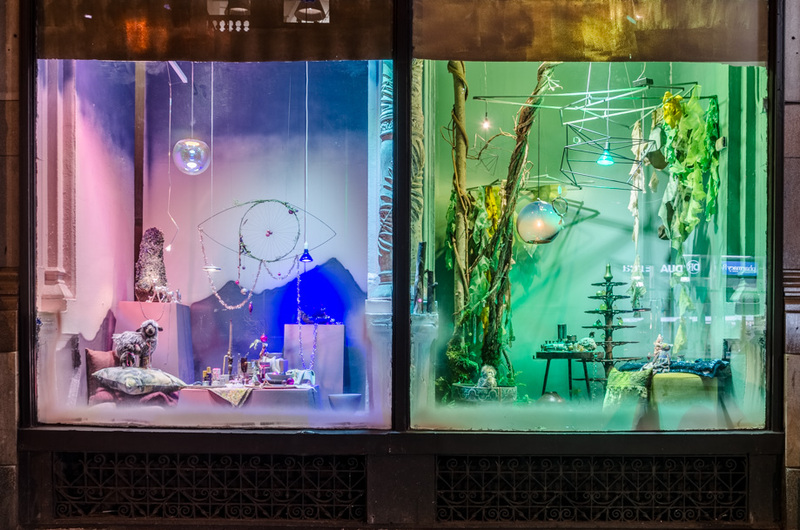 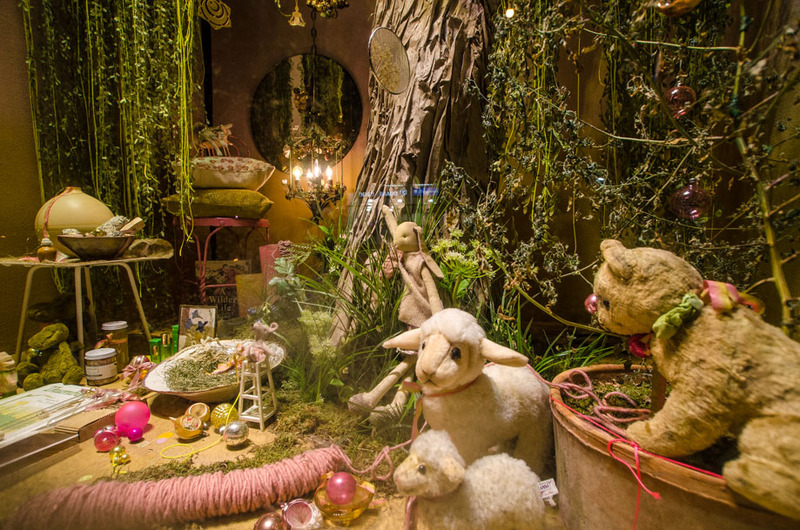 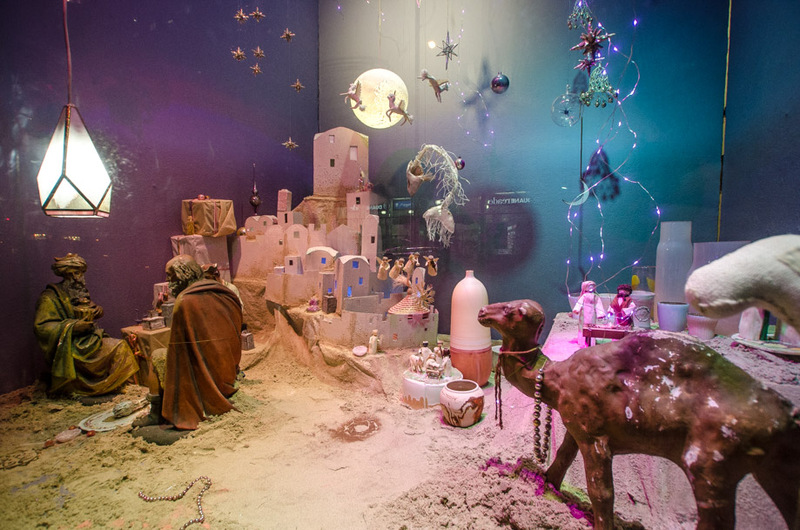 PSFK presents our annual look at the most visually creative holiday windows around New York City. 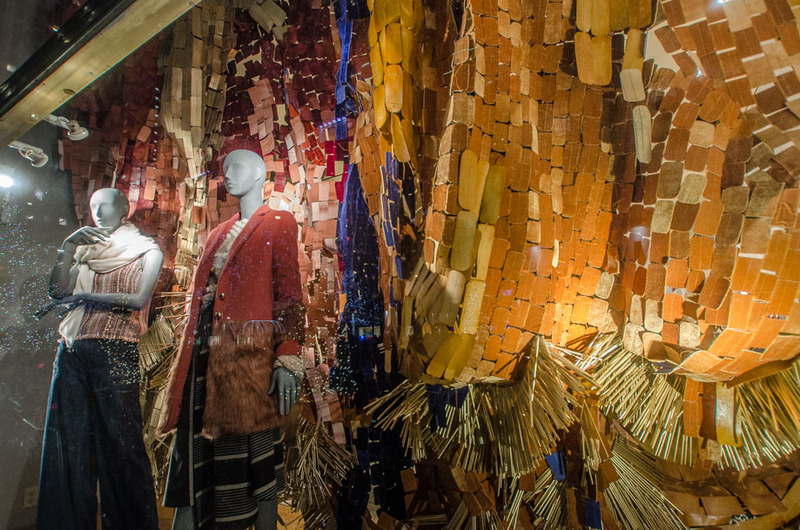 As in past years, we look out for examples that take a novel artistic approach, use materials in unique ways and generally approach themes that go beyond the traditional. 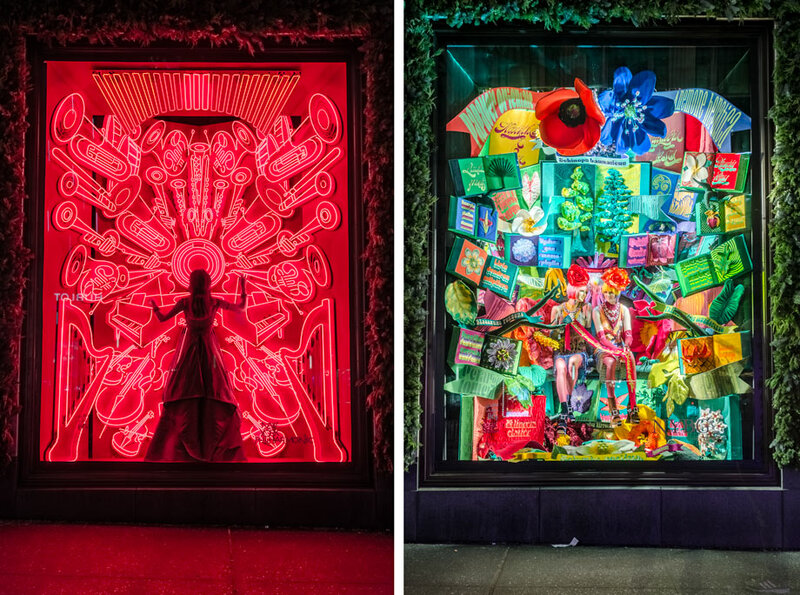 As with 2016, we have a shorter selection this year, as investment in unique holiday windows seems to be less of a priority for many retailers. 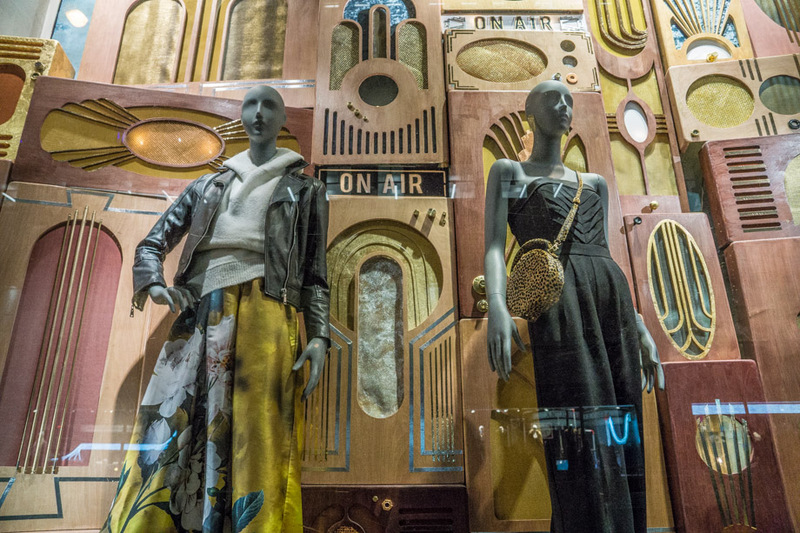 However, most of the stores we are sharing here have been consistently on our list for many years, and it’s good to see that commitment to keeping the art alive. 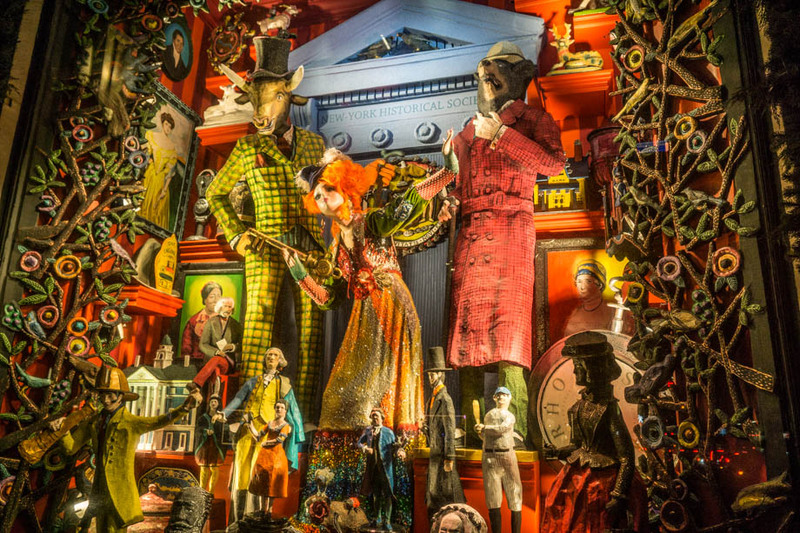 Check these out in person if you are in New York before the start of 2018. 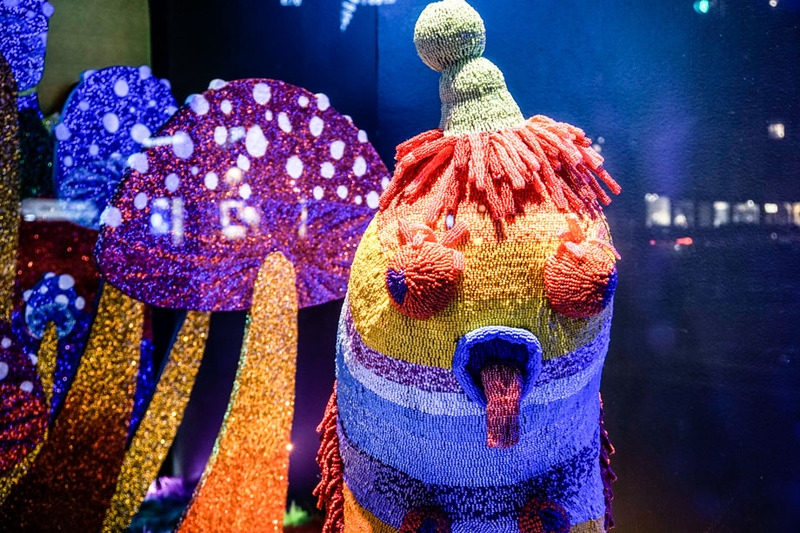 ABC Carpet & Home always pushes the artistic limits of retail window design with color, materials and lighting. 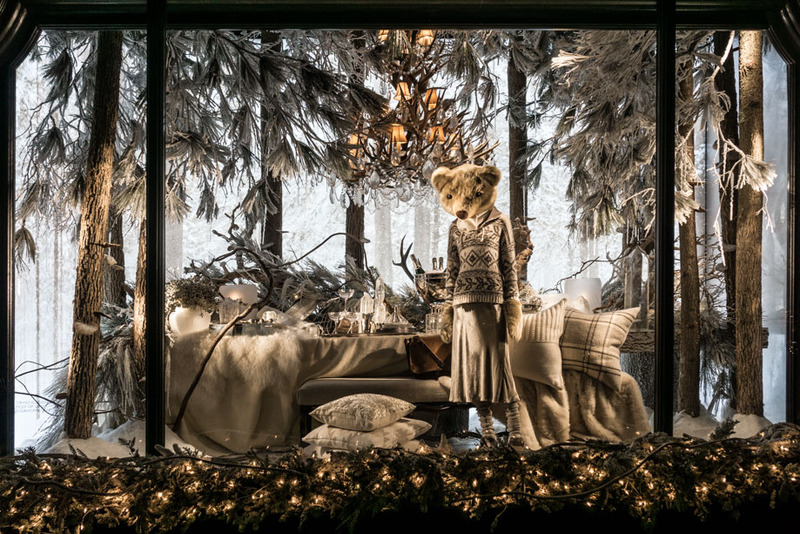 The 2017 windows incorporate more accessories than furniture, set in environments ranging from a forest to a nativity scene. 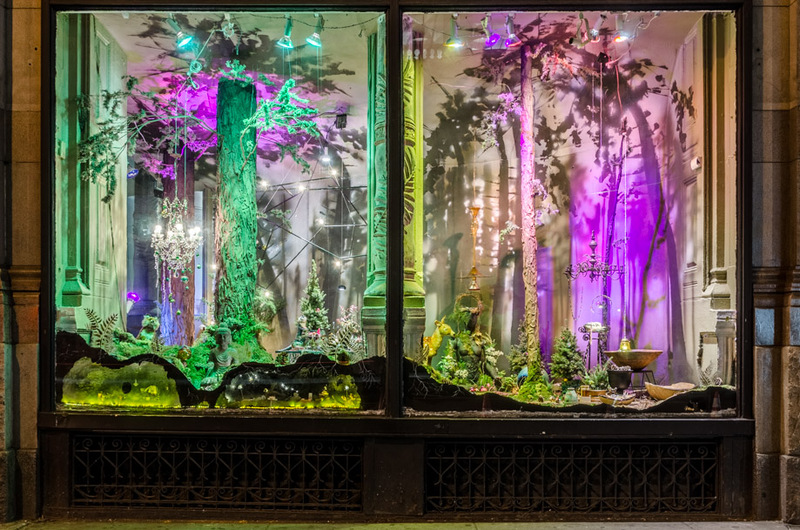 The two main windows on the corner of Broadway and 19th Street incorporate several small ‘underground’ rooms. 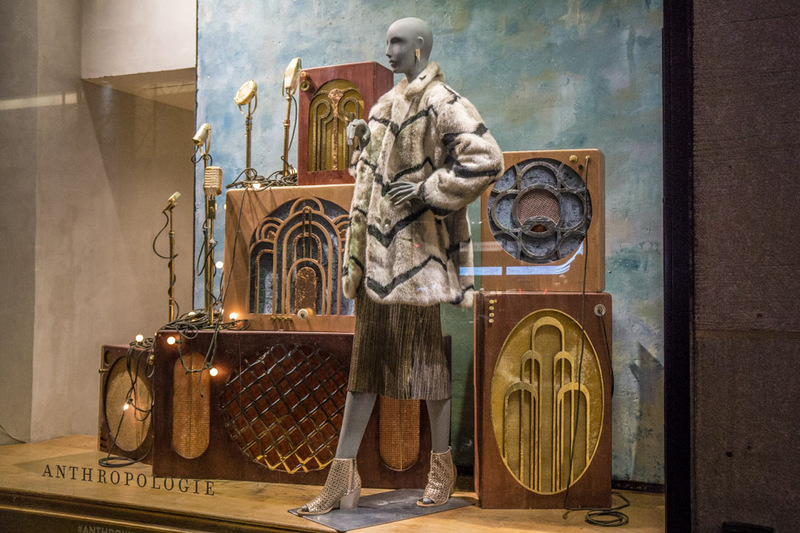 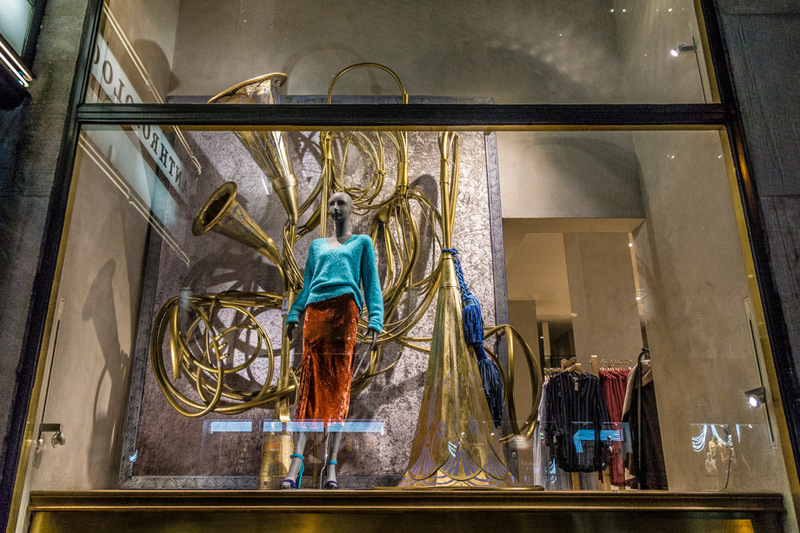 Music is the theme of Anthropologie‘s Rockefeller Center flagship store. 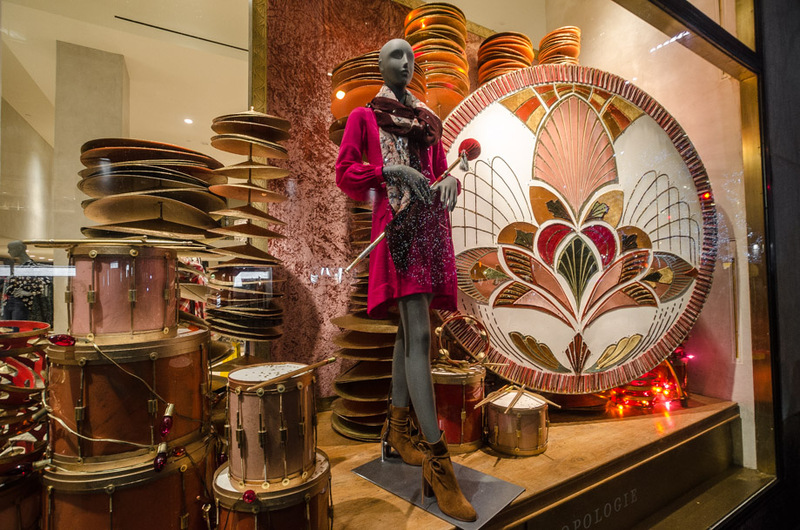 Each of the windows include instruments ranging from drums to horns, all handmade out of paper. 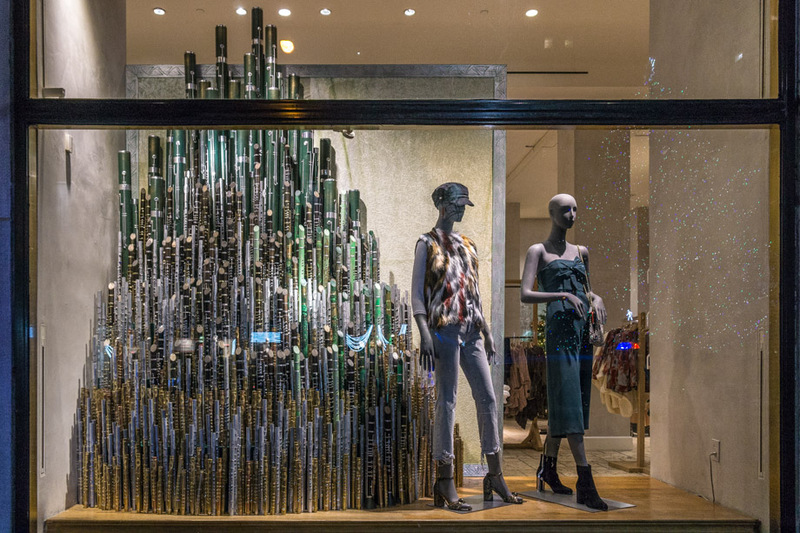 One of the windows features a tower made of hundreds of paper flutes. 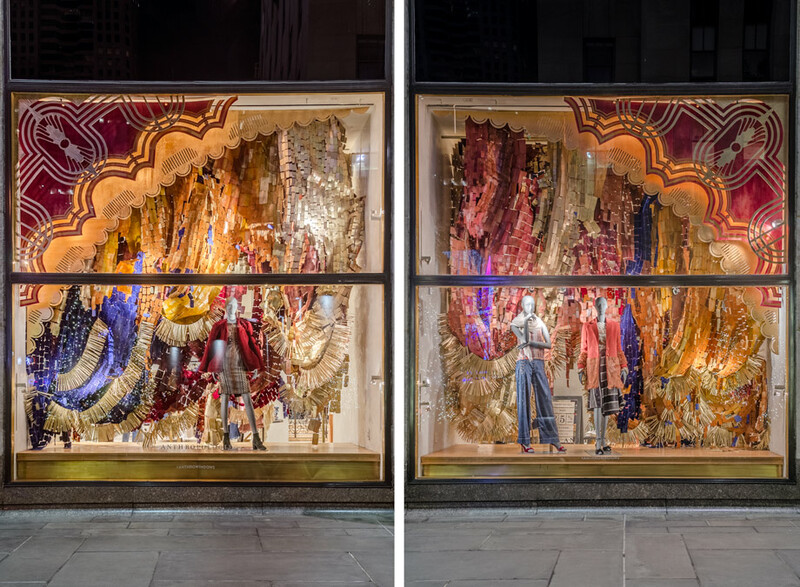 The two main windows on the plaza have elaborate colorful curtains incorporating plastic drinking straws. 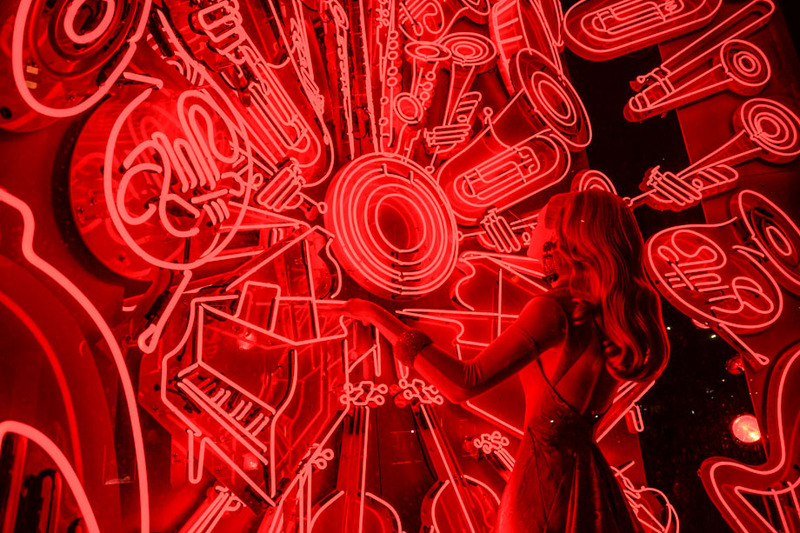 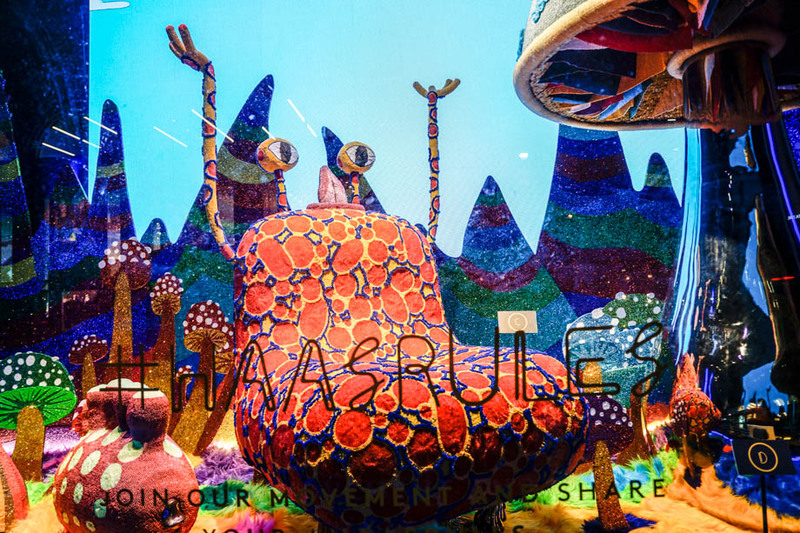 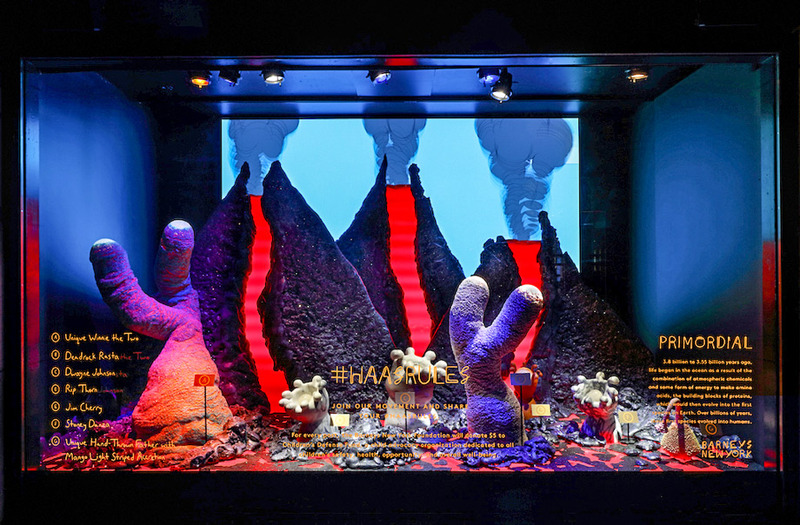 Barneys collaborated with the Haas Brothers to create a journey through time for its Madison Avenue windows. 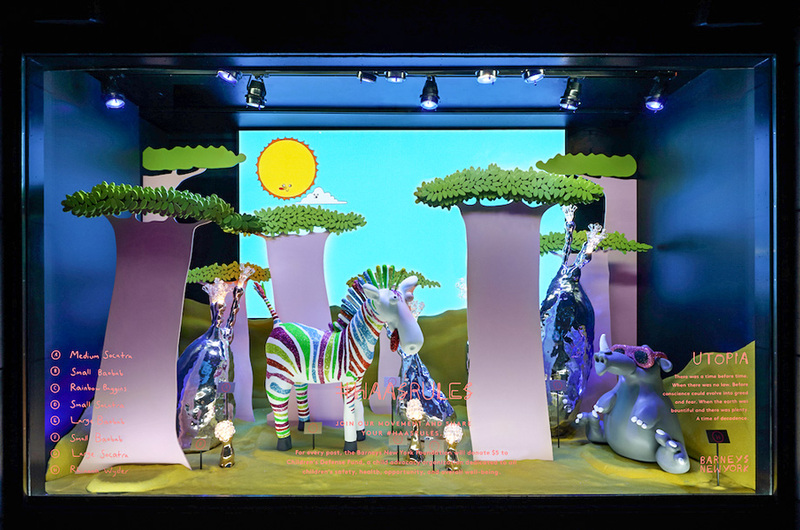 The windows contain the whimsical characters created by the artist twins Simon and Nikolai, including a multi-colored zebra named Rainbow Baggins who represents diversity and acceptance. 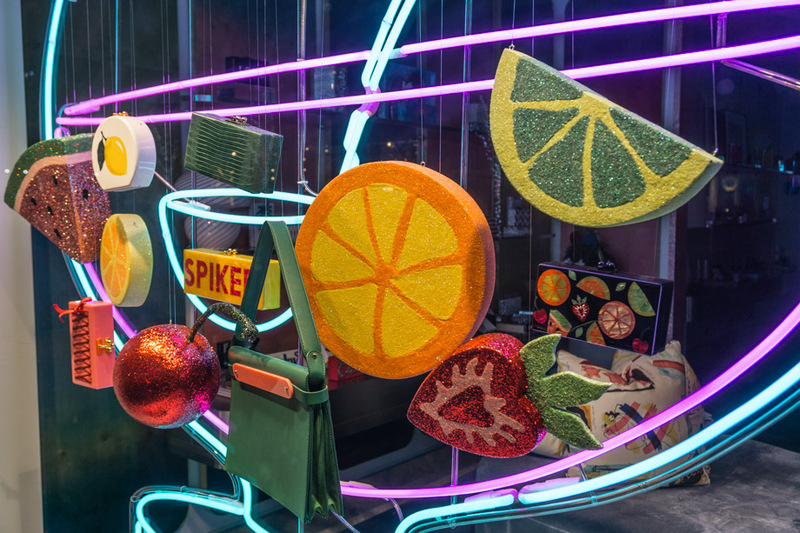 Several of the elements in the distant future window are furniture pieces crafted by bead artists from South Africa. 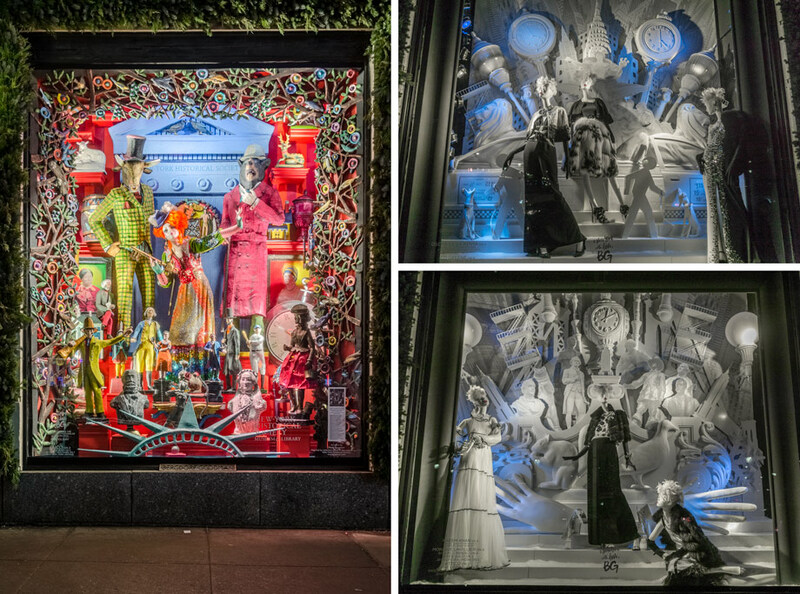 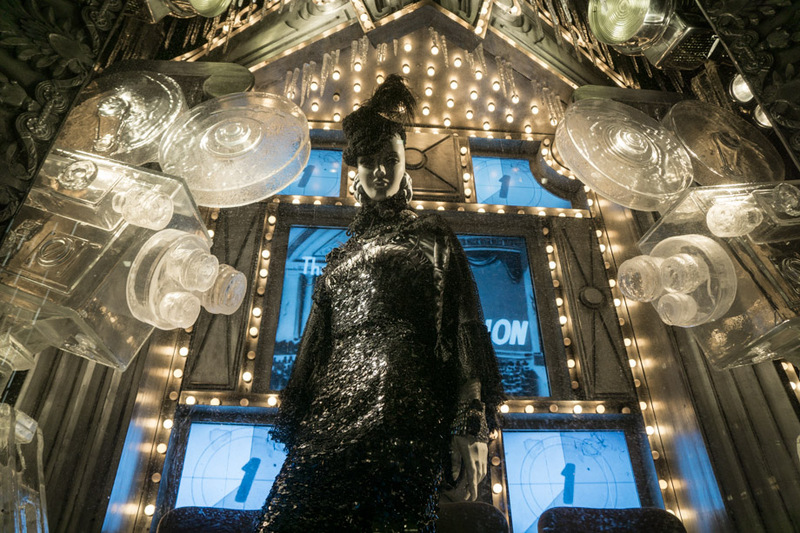 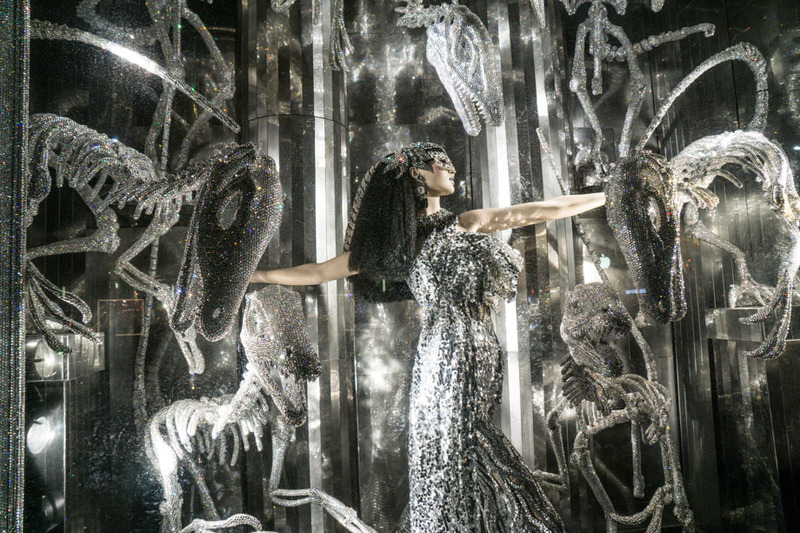 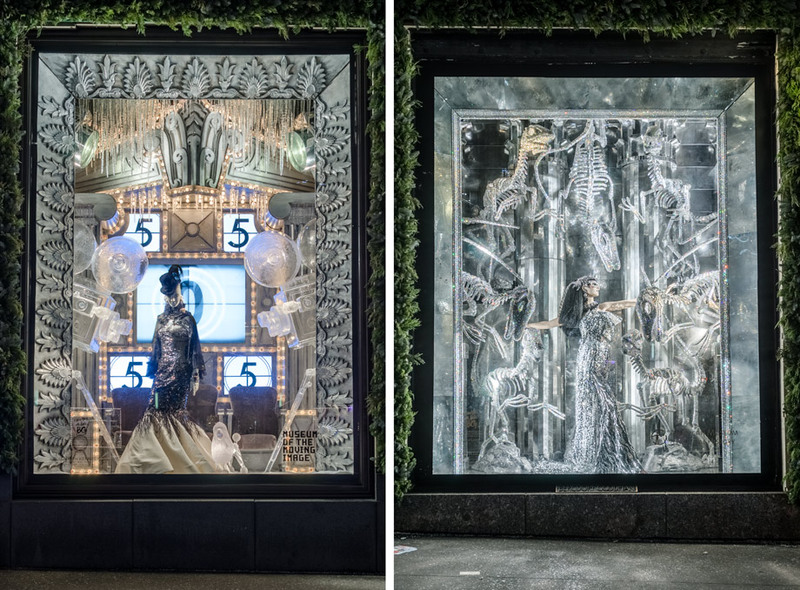 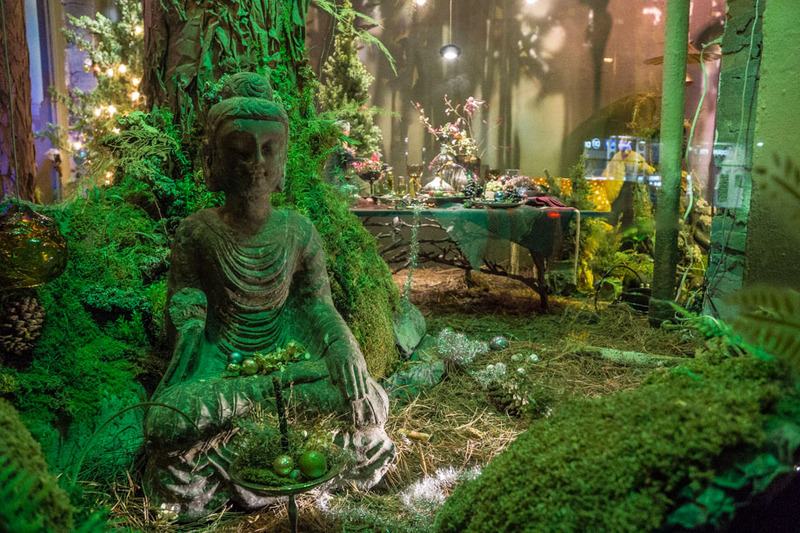 Some of New York City’s best cultural institutions are celebrated in a series of windows at Bergdorf Goodman. 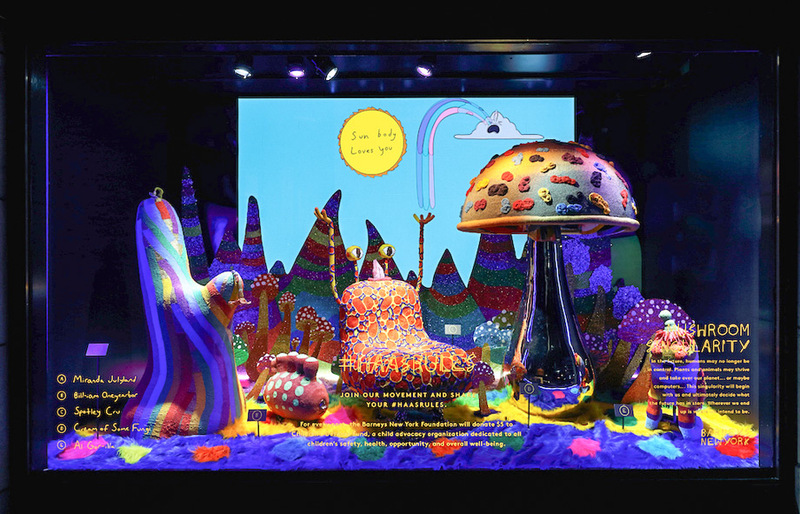 “To New York With Love” is the title of the collection featuring seven organizations: the American Museum of Natural History, Brooklyn Academy of Music (BAM), Museum of the Moving Image, The New York Botanical Gardens, New York Philharmonic, New-York Historical Society and UrbanGlass. 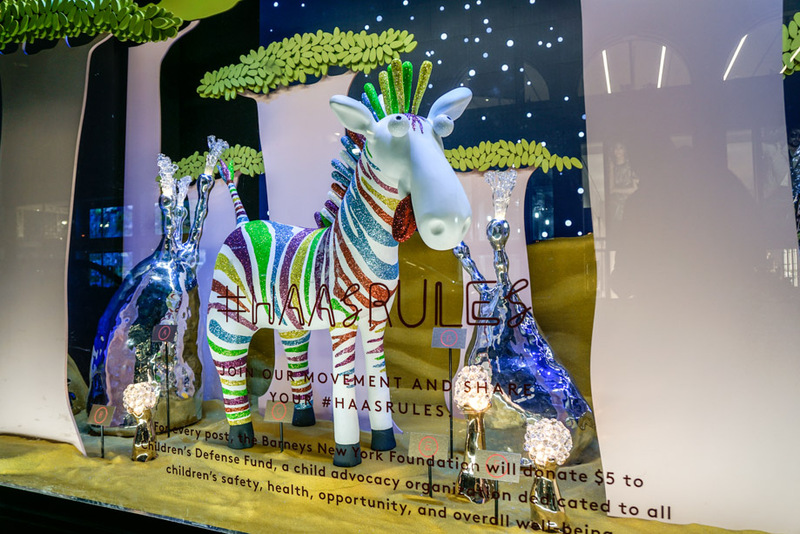 All of the windows are impressive, as usual, particularly the Swarovski crystal-covered dinosaur skeletons in the American Museum of Natural History window. 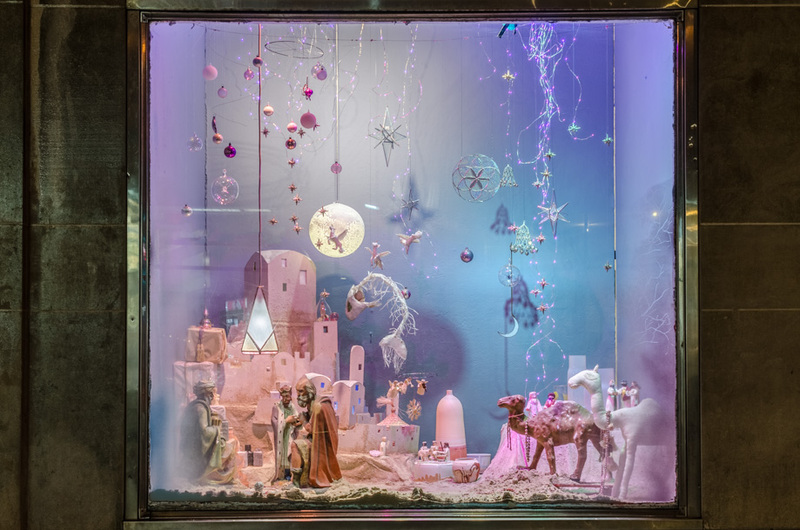 Sometimes simplicity is all is takes to be eye-catching, and the Edie Parker Boutique on Madison is an example of that. 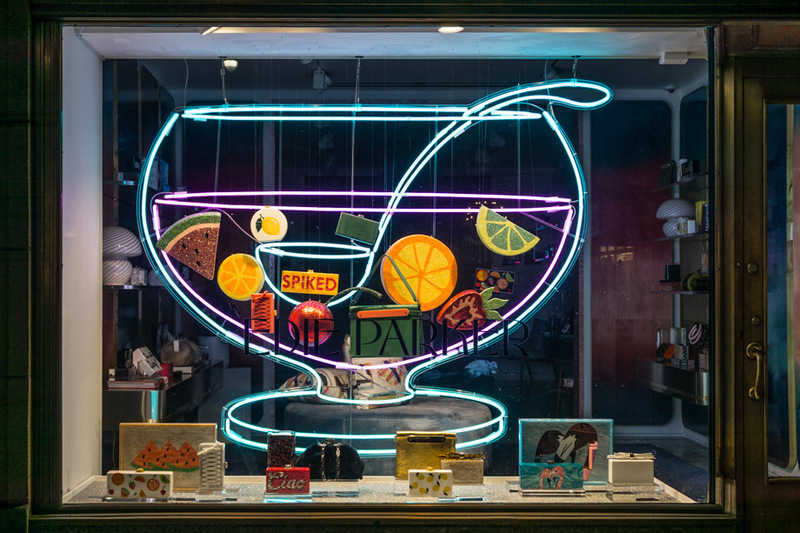 A neon punch bowl contains handbags shaped like cocktail garnishes. 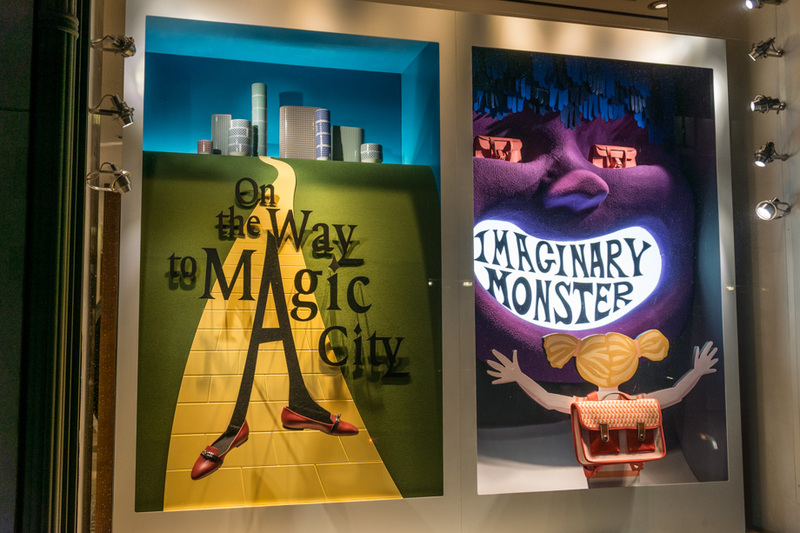 The graphic is unique and helps animate the bag collection. 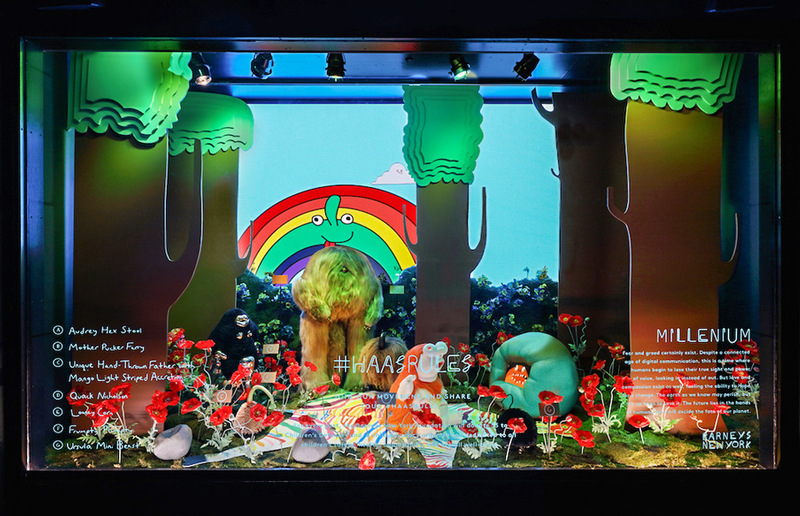 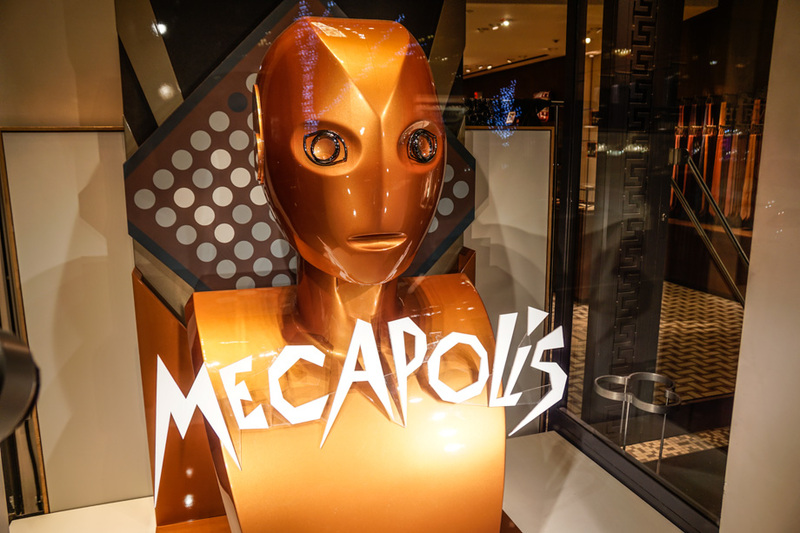 The Hermès windows on Madison are always ones we look forward to seeing—they’re sometimes quirky and done in collaboration with artists. 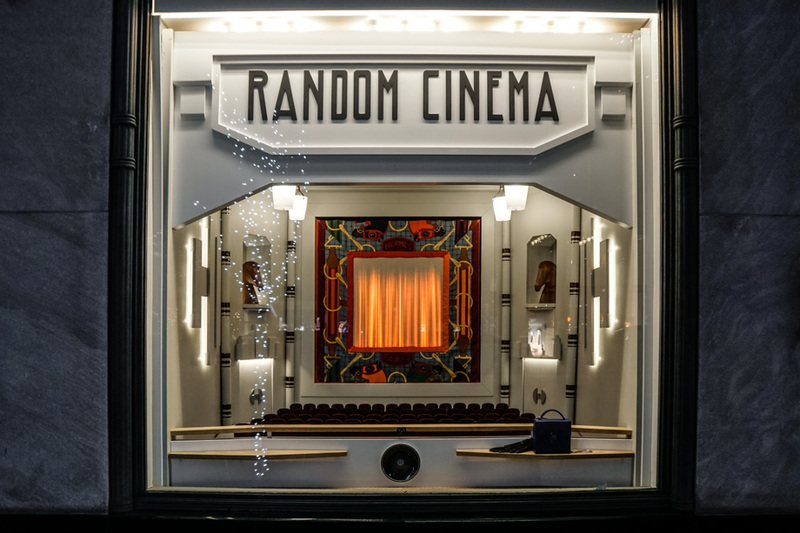 This year, the theme is cinema; the windows include a miniature ‘random cinema’ movie theatre and dimensional fictional movie posters. 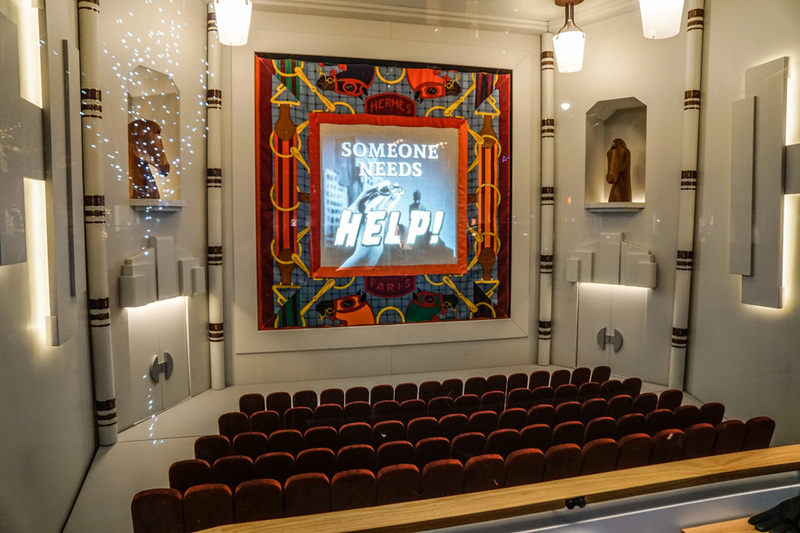 The scale model cinema starts playing a movie when someone approaches. 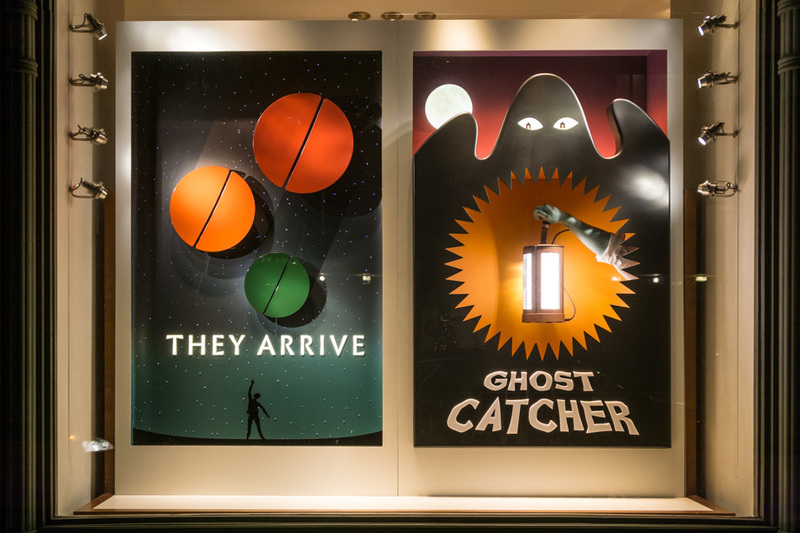 Each of the movie posters has Hermès products cleverly integrated into the design. 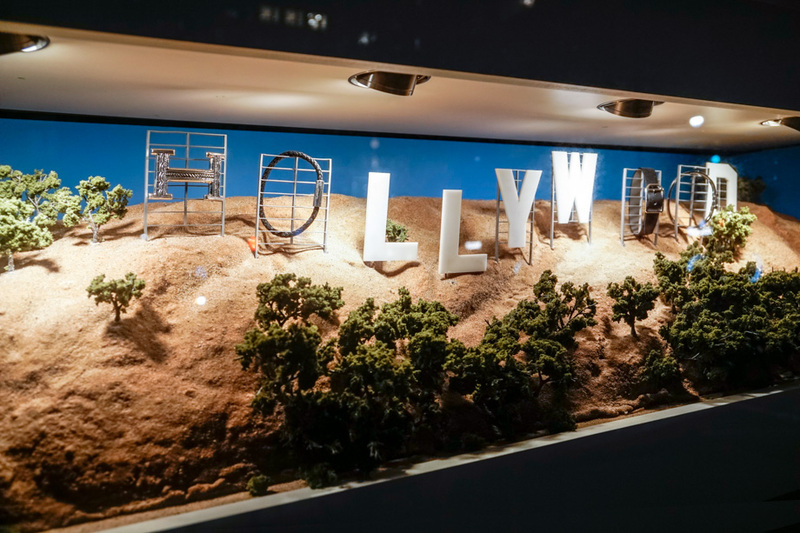 Somewhat hidden at the men’s location is a diorama of the Hollywood sign containing men’s accessories. 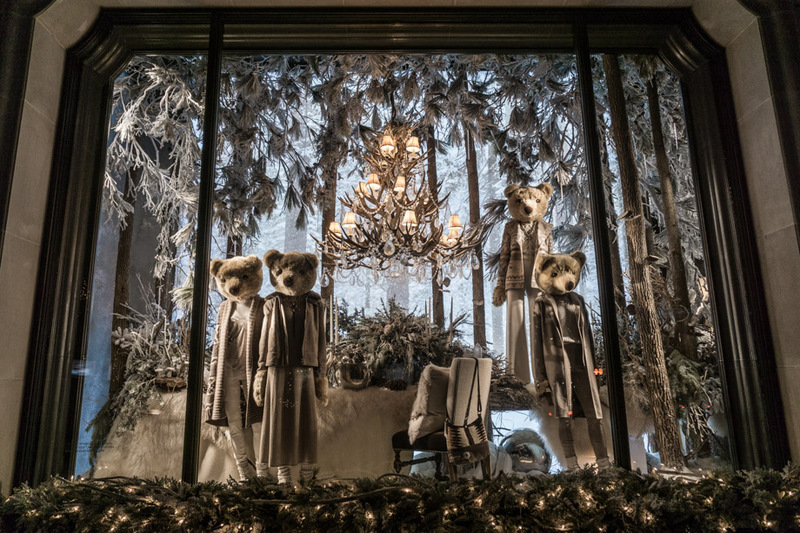 Ralph Lauren celebrates a 50th anniversary in 2017 and its Madison Ave windows are home to more than two dozen Polo Bears. 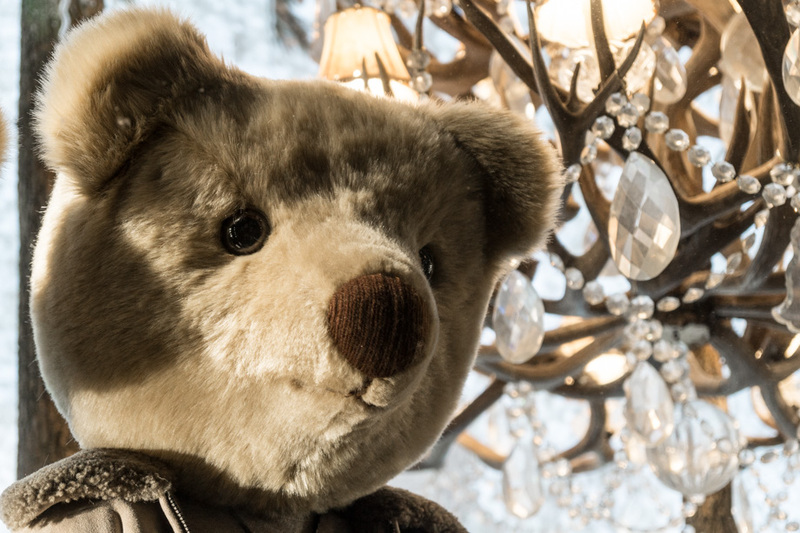 Mannequins in several detailed winter scenes in the main windows have bear heads, which are half cute and half a Doctor Who teddy-bear-invasion episode in the making. 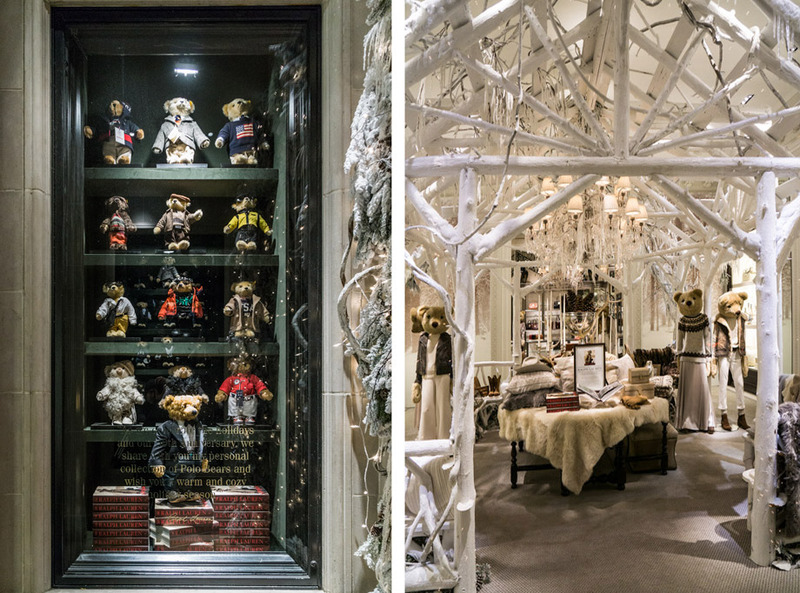 Flanking the entrance are windows containing part of Ralph Lauren’s personal collection of teddy bears outfitted in Polo garb. 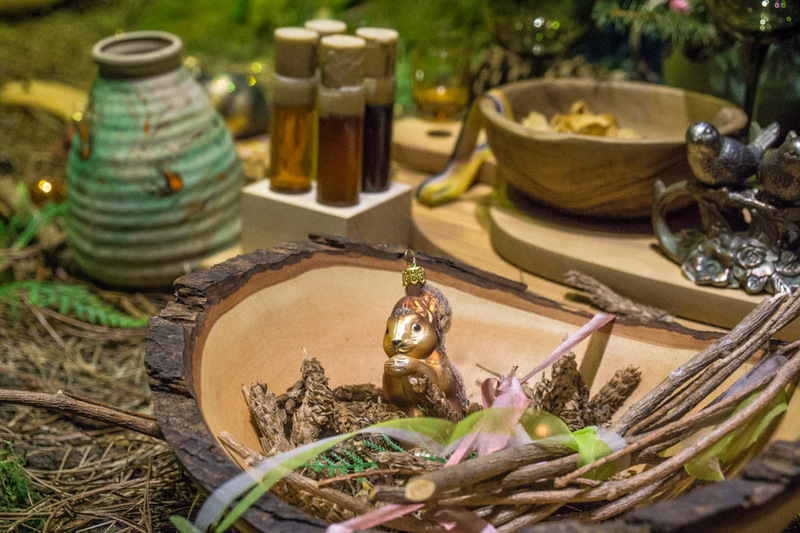 Equally impressive as the windows is the rustic winter cabin installed in the interior entry.